The plant cell culture offers many potential applications in agriculture and health-care. Some of the important applications of plant cell and tissue culture are given below. Vegetative propagation of plants is of considerable importance in agriculture, horticulture and forestry as it provides the multiplication of uniform material for crop planting(Clones). Traditionally, it is done by using cuttings, budding, grafting, corms, tubers and other vegetative propagules. The main problem with this method is that it is labour-intensive, low productivity and seasonal. Thus, tissue culture method of plant propagation, known as 'micropropagation' can be used to overcome the problems mentioned above. This technique utilizes the culture of apical shoots, axillary buds and meristems on suitable nutrient medium, and has been adopted for commercialisation of important plants such as banana, apple, pears, strawberry, cardamom, many ornamentals (e.g. Orchids) and other plants. • Initiation of culture - from an explant like shoot tip on a suitable nutrient medium. • Shoot multiplication - multiple shoots formation (Fig. 4A) from the cultured explant. • Rooting of shoots - rooting ofin vitrodeveloped shoots on rooting medium. • Transplantation - the hardening of tissue culture raised plants (Fig. 4B) as they aretender and subsequent transplantation to the green-houses or field. In recent years, much effort has been devoted to develop automated, robotised and more efficient transplant production methods. In India, the Department of Biotechnology (DBT) initiated a major network programme in 1989, and so far propagation protocols have been developed for more than 60 elite plant species. Most of the crops plants, particularly vegetatively propagated plants are systemically infected with viruses. If the stock of a cultivar (vegetative propagules) are infected with a virus, the entire clonal population raised with such stock will also be infected and reduce the yield and quality significantly. Therefore, the production of virus-free plants is important to increase yield and quality. Interestingly, the distribution of viruses in plants is uneven, and the apical or axillary meristems are generally free from viral particles. This has enabled scientists to produce virus-free plants by culturing small meristems (usually less than 1 mm long) collected from virus-infected plants. Meristem culture technique is now successfully used to produce virus-free plants (but not virus-resistant plants) in a number of important clonal plants like potato, sugarcane, banana and apple. The scheme used for the production of virus-free plants by meristem culture is essentially same as micropropagation technique, except that the starting material (explant) is meristem which is dissected out from shoot tips of infected plants. The artificial seeds (also called as synthetic seeds or somatic seeds) can be utilized for the rapid and mass propagation of elite plant species as well as hybrid varieties. Artificial seeds are produced either by encapsulating the somatic embryos in a protective coating, i.e., calcium alginate beads or by desiccating the somatic embryos with or without coating. A typical artificial seed is shown in Fig. 5. It is very difficult to produce hybrids in case of inter-specific and inter-generic crosses (crosses between distantly related plants) because of abnormal development of the endosperm, which causes premature death of the hybrid embryo and leads to sterile seeds. The embryo from such sterile hybrid seeds can be excised at an appropriate time and cultured on a suitable nutrient medium to produce novel hybrids which is otherwise not possible. This is known as embryo rescue. Several useful hybrids were produced in a variety of crops using this technique. The technique of haploid production through anther and pollen culture as well ovary culture is of immense use in plant breeding to improve crop plants. It enables raising plants expressing traits that are otherwise recessive. The genetically homozygous diploid plants, which serve as parents in cross breeding can also be produced by diploidisation of haploid plants using colchicine chemical. The endosperm is a triploid tissue and an excellent material to produce triploid plants by culturing endosperm tissue. Triploid plants usually show seed sterility or seedlessness, which is desirable in crops like citrus, apple and pear. For many years, sexual hybridisation has been successfully used for crop improvement, however this method is limited in most cases, especially inter-specific and inter-generic crosses. The somatic cell hybridisation(also known asparasexualhybridisation) offers an excellentalternative for obtaining distant hybrids with useful agronomic traits (known as somatic hybrids or parasexual hybrids), which would never be formed in nature through sexual fertilization. Essentially, the protoplasts are isolated from the two different plants and are allowed to fuse with each other and the required fusion products (hybrid cells) are selected as discussed earlier (see protoplast isolation and fusion). The first inter-specific somatic hybrid between Nicotianaglauca and N. langsdorffii was produced by Carlson and his associates in 1972. Later, Melchers and his team in 1978 developed the first inter-genetic somatic hybrids between Solanumtuberosum (potato) and Lycopersiconesculentum(tomato) and the hybrids are known as'PomatoesorTopatoes'. 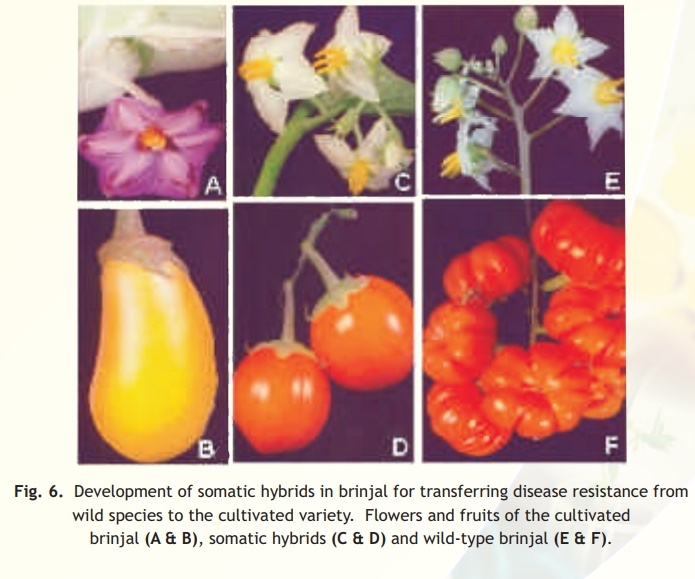 Several inter-specific somatic hybrids have been produced in number of crops like brinjal(Fig. 6). It is also possible to produce cytoplasmic hybrids (cybrids) through protoplast fusion in which the genomes of one of the partners is lost. Alternatively, the isolated and purified organelles - chloroplasts or mitochondria from one species can be fused with the recipient protoplasts from a different plant species (known as organelle transferor organelle uptake) to transfer useful cytoplasmic traits like herbicide tolerance and cytoplasmic male sterility. Plants produce throusands of sophisticated chemical molecules. These include the chemicals required for a plant’s basic metabolic processes such as sugars, lipids, amino acids and nucleic acids (primary metabolites) and also some other additional products such as alkaloids, resins, tannins, latex, etc. (secondary metabolites). The function of secondary metabolites in plants is not clearly understood, although they have been implicated in defence mechanism of the plant against pests and pathogens as well asfeeding by animals. However, many of the secondary products, especially various alkaloids are of immense use in medicine (Table 1). Such compounds are produced in plants only in small amounts, and therefore, they are quite expensive. The indiscriminative use of such valuable medicinal and other plants has brought them to near extinction. A possible solution in this direction is provided by cell and root cultures. Certain plant products such as shikonin are being produced commercially in large-scale using bioreactors. It has been observed that the long-term callus and cell suspension culture and plants regenerated from such cultures are often associated with chromosomal variations(somaclonal variation). It is this property of cultured cells that finds potential application in the crop improvement and in the production of mutants (e.g., disease resistance in potato). Larkin and Scowcroft (1981) proposed the term 'somaclones' for plant variants obtained from tissue cultures of somatic tissues. Similarly, if the tissue from which the variants have been obtained is having gametophytic origin such as pollen or egg cell, it is known as 'gametoclonalvariation. Germplasm refers to the sum total of all the genes present in a crop and its related species. The availability of a wide diversity (which includes land races, cultivars and primitive wild species of crop plants) and its conservation is utmost important as they are invaluable for future breeding programmes. However, the existence of primitive cultivars and wild relatives of crop plants has been endangered by the extensive use of newly introduced cultivars and hybrids, and this has posed a great concern to avoid the erosion of plant genetic resources. Therefore, attempts have been made to preserve the genetic resources by conventional methods (e.g. seeds, vegetative propagules, etc. and it is known as in vivogene banks) as well as non-conventional methods, i.e. cell and tissue culture methods (known as in vitrogene banks). This will ensure the availability of valuable germplasm to breeder, to develop new and improved varieties. The germplasm conservation through the conventional methods has several limitations such as, the short-lived seeds, seed dormancy, seed-borne diseases and high inputs of cost and labour. On the other hand, the biotechnological approaches for the conservation of plant germplasm can surpass many of these problems, and it can be done by the following approaches. • Freezing storage or Cryopreservation - this utilizes the long-term preservation ofcells and tissues (e.g. shoot tips, axillary buds, meristems, somatic embryos, etc.) at ultra-low temperature (-196oC, i.e. in liquid nitrogen) for indefinite time by using cryoprotectants (e.g. dimethylsulfoxide, glycerol, proline and mannitol). The cells and tissues can be recovered after thawing, and can be used for regeneration of plants. • Cold storage - this uses the short- or medium-term storage of germplasm by usingshoot tip, nodal or meristem explant cultures. The storage in done under conditions that impose slow growth such as low temperature (4oC or 15oC), nutrient limitation or the addition of growth retardants (e.g. absisic acid) in medium.